Twenty years ago, Halloween was pretty low-key. Falling on the tail end of October between 秋祭り (aki matsuri, fall festival) season and Christmas, it was apt to be overlooked or underplayed. Halloween also seemed ちょっとコワイ (chotto kowai, a little too foreign and hard to approach). Kowai usually means “scary” or “frightening,” but written out like this in katakana, it could point to feelings of nervousness or inadequacy. Besides, for many Japanese, the “Trick or treat” slogan was hard to pronounce and understand. お菓子をくれないといたずらするぞ (O-kashi o kurenai to itazura suru zo, Give me sweets or I’ll play a prank) was the official translation for “Trick or treat” that was in circulation. To the older generation of Japanese, however, the custom seemed like a 無用の贅沢 (muyō no zeitaku, useless extravagance) and 勿体ない (mottainai, wasteful). My older relatives were united in the view that 砂糖は国を滅ぼす (satō wa kuni o horobosu, sugar will ruin the nation), and they cast a wrathful gaze on the festivities. それも今は昔 (Sore mo ima wa mukashi, That was then, this is now). Halloween has become one of the coolest days on the Japanese calendar, and it’s far less about sweets for kids than it is an occasion for grown-ups to deck themselves out in 仮装 (kasō, costumes) for all-night prowling in Shibuya and Shinjuku and, hopefully, an eventual hook-up with a cute witch or a Captain America. We are, after all, in the middle of a 糖質制限ブーム (tōshitsu seigen būmu, boom in cutting back on sugar and carbs). A Halloween that says “yes” to elaborate costumes and “not so much, thanks” to sugary sweets makes more sense, even to my cantankerous relatives. 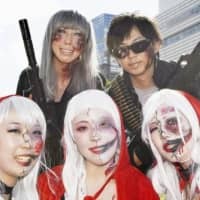 On the night of Oct. 31, Shibuya is more than usually crammed with partygoers, all in glorious Halloween getup or carting suitcases packed with costumes and コスメ (kosume, cosmetics). Young women tend to be carrying these, and they change into Halloween garb in the less crowded of the public トイレ (toire, toilets), in places like Bunkamura and Tokyu Hands. They then apply elaborate makeup right on the street in センター街 (Sentā-gai, Center-gai), often uploading the whole process to social media. The Shibuya 名物 (meibutsu, “specialty item”) — the DJポリス (DJ porisu, “DJ police”) — are sure to be out, manning all positions on スクランブル交差点 (sukuranburu kōsaten, the “scramble crossing”) facing Shibuya Station’s Hachiko Exit to guide traffic, exhort people not to litter, advise girls to get home safely and issue other reminders over loudspeakers. The “DJ police” are crowd-control cops from 警視庁 (Keishichō, the Metropolitan Police Department) who are known for demonstrating a flair for humor mixed with gentle concern on such occasions. Some of their lines are real tear-jerkers, like: 明日はまだ平日です。明日のことを考えてそろそろ帰りましょう (Ashita wa mada heijitsu desu. Ashita no koto o kangaete sorosoro kaerimashō; Tomorrow is still a weekday. Let’s think about tomorrow and start heading for home). Not that many people take the words to heart — many of them simply cross the street to Shibuya Station as if they were catching the train for home, and then proceed to ブラブラする (burabura suru, hang around) the area until morning. Halloween has turned into a genuinely fun event, and one of the very few affairs that are free from the pressures of gift-giving and restaurant reservations. Other Western holidays, like クリスマス (Kurisumasu, Christmas) and バレンタイン (Barentain, Valentine’s), are bloated with hype and consumerism, while traditional お正月 (o-Shōgatsu, New Year’s) piles on the stress brought on by family gatherings. Halloween, on the other hand, is loose and relaxed. According to the 二十代の若者 (nijūdai no wakamono, 20-something youths) I’ve talked to, Halloween is practically the only day when spontaneous ナンパ (nanpa, asking women out) on the street or at a party is acceptable, whereas at any other time of year, most everyone relies on dating apps and services. 逆ナン (gyakunan; “reverse pick-up,” i.e., women taking the initiative to ask guys out) is welcome too. Hoping to get lucky, young men will deck themselves out in full regalia, ranging from that of the ever-popular Harry Potter to the Japanese pre-Meiji Era hero Sakamoto Ryoma, widely acknowledged as the first Japanese male to wear leather shoes and carry a pistol. Their costumes can be bought on the cheap at the nearest ドンキ (Donki, Don Quijote store), and at this time of year ¥100 stores carry all manner of Halloween paraphernalia. 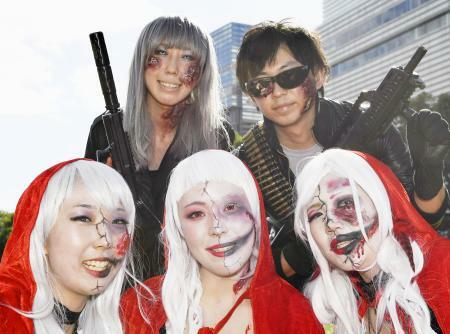 For young women, Halloween affords a chance to go all out on facial transformation, and the most popular メイク (meiku, make-up) look of the past few years has been the ゾンビ (zonbi, zombie). ゾンビメイクキット (zonbi meiku kitto, zombie make-up kits) are available online and tweets with the #ハロウィンメイク hashtag offer tips on how to achieve the perfect “Dawn of the Dead” look while still leaving a dose of adorableness (this is important). Zombified young women will make sure there are some ナチュラルメイク (nachuraru meiku, regular makeup) selfies in their phones, so they can show potential dating partners what they look like once the zombie face comes off. They’re aiming for the ギャップ萌え (gyappu moe) — when a guy falls for the gap between two differing identities of the same girl — and the subsequent キュンキュン (kyun kyun, getting all gooey) that signals the start of a relationship. Who would have thought zombies in Japan could be so romantic?